"We’re starting a new cycle of development today. We’re focusing mostly on improving Instant Search feature. Taking into account your suggestions, we will try to improve the use of our new search. Opera Touch is also being improved. You showed a huge interest in the product, and we can promise you, that we’ll do it even more useful for you." The Chromium has been updated to version 67.0.3396.18. "This is a quick-fix update for macOS users only. Some of you have had problems with Opera crashing." With Opera 55, ffmpeg is broken again (meaning Facebook videos do not play). "Today we start the week with a Developer update. In this build, you will find a new Settings page. The new settings page is divided into two categories: basic, and advanced. We’ve also touched up the page to make it look more sleek. Basic settings will appear first, when opening the full settings page. 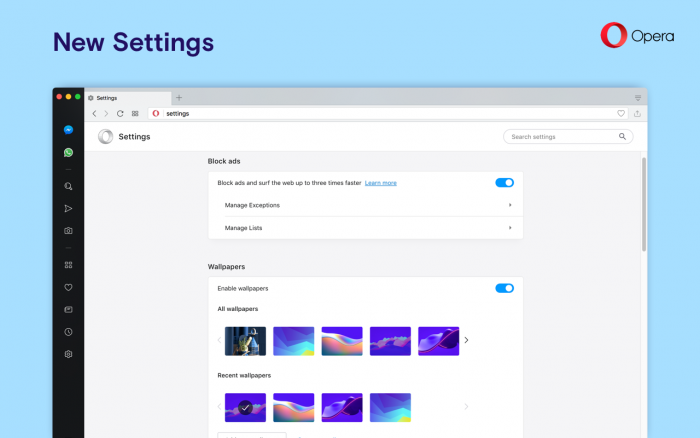 Here, you will find settings for ad blocking, wallpapers, browser appearance, the sidebar, synchronization, search engines, making Opera the default browser, and startup options. Clicking the “Advanced” label at the bottom, will expand the page with additional settings. This includes privacy, and security, passwords, and forms, VPN, battery saver, My Flow, search pop-up, video pop out, personal news, Opera Turbo, start page, user interface, languages, downloads, system, shortcuts, and reset settings. You can search for particular settings with the Search settings bar on top of the page. We improved also the look of dialog in the default Cinnamon theme for Linux Mint." Hi @mmichel, it seems to be a problem with incompatible version of glibc. You can try to use one of the ffmpeg versions mentioned here, or upgrade your distro to the latest version, which includes glibc >= 2.27. There are also other workaround, like e.g. using few versions of glibc at the same time, or unpacking the 2.27 version, and use it in chrooted environment, but that might be a bit complicated for some of the users. Hi, problem with animated wallpaper is fix with 55.0.2962. Btw, i really appreciate that we can now remove unwanted search engines. And now i can't delete cookies for only one site, for example only for twitter. I can delete only all data for all sites for 1 hour-all time. Good job, boys. We need more useless decorations and animations. @onemoreuser Yes, you can still delete cookies for individual sites. "This week we prepared for you new developer update, which includes mostly new Settings Page improvements. - DNA-69987 – Crash after Clicking in O-menu (Win7). - DNA-70064 – Snapshot selection frame is not visible on Win7." The Chromium has been updated to version 68.0.3423.2. "We fixed the bug with icons changing, after renaming a folder in bookmarks bar. Thanks for all of you who pointed this out. We also polished up our new Settings page." The Chromium has been updated to version 68.0.3438.3. "With this version, we’re turning on the bookmarks bar by default. There will be five suggested bookmarks in it, chosen based on the most popular pages in your country. Of course, you can disable or later re-enable the bookmarks bar in settings, and edit or remove bookmarks in the bookmarks page. To manage your bookmarks bar, go to Settings (Preferences on Mac) > Appearance, and turn off or on Show bookmarks bar. To add, change, or remove bookmarks from the bookmarks bar, go to Bookmarks > Bookmarks Bar. Known issue: there is an unrecoverable crash-loop on Windows on some profiles. We had to roll back the Opera developer for Windows to the previous version for now." The Chromium has been updated to version 68.0.3440.15. "Today we’re presenting quick developer update. 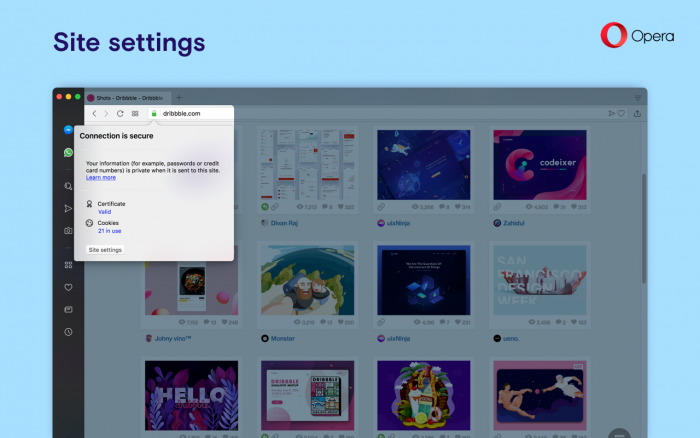 We’ve added missing option to import cookies from other browsers on the new Settings page, and visual focus of UI controls. Known issue: crash on synchronisation autofill." Remote devices in Dev tools does not work. but not in Chrome. Opera's ones does not find device connected.